L also took video of me, too, but that's hasn't been put online yet. Soon, I guess! I love Riley. Thank you for your kind words about Weegee on my blog. Seeing Riley's photos made me smile. Something I haven't done since Weegee died on Thursday. 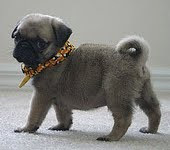 AWWW another Riley how cute hi Riley i would like you to meet My Riley he is an 9wk old balck male pug take a look!!! !